As kids move into their school years their ability to understand and participate in a variety of games increases. Additionally, their capacity and desire to be helpful is high, making them cooperative to parental suggestions. Smart parents and other involved caregivers should take advantage of these years to help foster a love of exercise and activity in kids. Once they are older, it gets harder to change bad habits, so these early years are important in terms of lifelong fitness. While kids need a certain amount of routine in their lives, they can easily get bored if each day is the same as the last. Because children tend to be open minded and willing to try new activities, parents should expose them to an array of active games as well as establishing the habit of moving their bodies in their everyday lives. Kids do their best learning while they are having fun, so there is no need for kids in the six to eight year old range to perform calisthenics, but they should get time each day to run, jump, and climb. Parents can help to stave off boredom by enrolling kids in short term (a few weeks per session) sport and athletic classes, letting kids choose activities that they find interesting. In this way, children are likely to find a few favourites that they may choose to continue long term. Because they are so eager to please, children aged six to eight are ideal candidates for parental sidekicks when it is time to wash the family car, pull weeds in the garden, or walk the dog. Many parents find that this age is ideal for introducing a pet to the household, if one is not already in place. School aged kids are old enough to help with the daily care and maintenance of a pet, and if walking Rover gets the kids away from the television and computer, it's a very good thing! Today's kids are accustomed to being driven to play dates and other activities, and while parents are certainly well-meaning, this practice is taking its toll on the health and fitness of our kids. Walking is one of the best activities for people of all ages (yes, us too!) so when it is safe to do so, kids should be encouraged to use their feet as their main means of transportation. Of course, it is not a safe practice to send young children out alone, but when walking with a parent, older sibling, or other responsible caregiver, there are few things more important for lifelong fitness than establishing a regular walking routine. As gift giving occasions arise, caring adults might want to consider opting for toys and sporting equipment that encourage active play. While board games and videos are fine in moderation, all children need to play actively in order to grow and develop in a healthy manner. 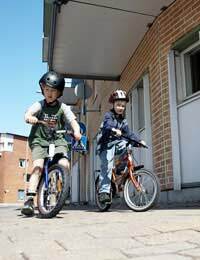 Bicycles, roller skates, basketball hoops, jump-ropes, and climbing frames all give kids the opportunity to build healthy bodies while they have fun. Kids are not all that much different from the rest of us -- they will only continue an activity if they find it pleasurable. Childhood obesity is a very real problem in the world today and research supports the notion that overweight kids are more likely than their peers to grow into overweight adults. Considering all of the health risks associated with carrying extra weight, parents need to make fitness a priority for their families. Is Your Child Doing Enough Exercise?